U.S. health consumers’ purchase and use of over-the-counter medicines (OTCs) generate $102 billion worth of value to the health system every year. Half of this value accrues to employers who sponsor health insurance for their workforce; 25% goes to government payers (e.g., Medicare, Medicaid); and, 25% returns to self-insured and uninsured people. 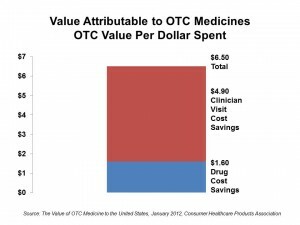 For every $1 spent on OTCs, $6.50 is saved by the U.S. health system, shown by the chart. For millions of health consumers, OTCs substitute for a visit to a doctor’s office: most cost-savings generated by OTC use are in saved costs of not visiting a clinician, as discussed inThe Value of OTC Medicine to the United States, published by the Consumer Healthcare Products Association in January 2012. Americans spent $23 billion on OTC meds in 2010 for self-treatment at home. The most common conditions people treat themselves are the common cold, headaches, body pain, allergies, heartburn, lower GI tract issues, dermatitis, and fungal infections. In the financial analysis, CHPA focused on seven of the most common OTC categories for self-treatment: allergy (generating 14% of total savings), analgesics (13% of savings), anti-fungals (12%), cough/cold/flu (28%), lower and upper GI (9% and 16%, respectively)), and skin medications (6%). Taken together, these seven categories represented $102 billion worth of value to the U.S. health system overall. Health Populi’s Hot Points: About 60 million people in the U.S. would not seek treatment from a physician if OTC meds were unavailable in the market. People who self-care save the health system — insurance companies, employers and government payers (read: taxpayers) — billions of dollars. Who are these people who are saving the U.S. health system stakeholders money? It’s the uninsured, CHPA points out. These individuals self-caring save more for the system than other insurance sub-sets due to a greater dependence on OTCs as their primary treatment option. For these people, the medical home is the patients’ home. This is rapidly becoming the case for many insured and under-insured U.S. health citizens, as well. Peoples’ access to safe, high quality, accessibly packaged and marketed over-the-counter medicines is a critical underpinning for building a more sustainable U.S. health system where empowered health consumers can participate more in their own care.